You get the impression that, despite the culinary sacrifices and shed buckets of sweat in training still look the same? Know that, contrary to what you think is unlikely to be simply wine “weak genes”. Most likely, the problem lies in your approach, namely that it does not change. 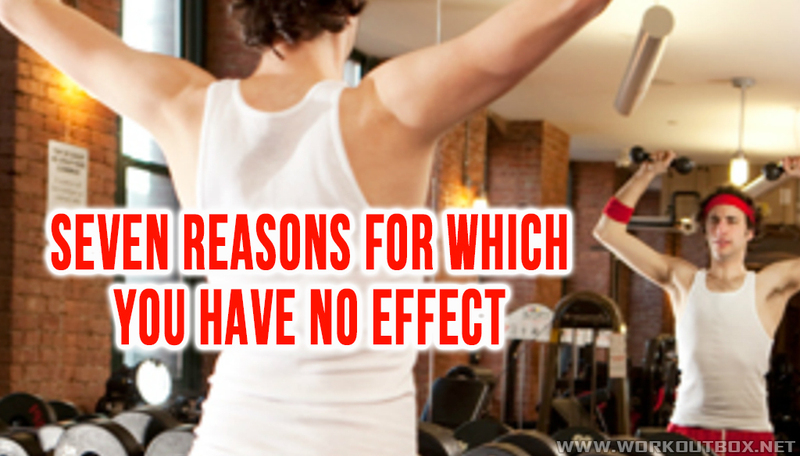 Below is the list of the most common reasons for which, despite the efforts, your silhouette does not change. Even the best diet ceases to finally bear fruit if applied non-stop, in the same form for a long period of time. Many people in the meantime is the illusion that menu, which checked at the beginning of an adventure with a gym, bring the desired effects at a higher level of fitness. In practice, however, rarely so happens, which is associated with a change in physiological conditions, dependent, inter alia, of weight and body composition and activity of selected hormones. The principle is simple – if something does not bring effect, this should be modified. Not necessarily in terms of revolutionary change, sometimes even with minor adjustments, such as adding or subtracting 5 – 10% of calories, carbohydrate intake on diversity training and non-training days, the introduction of new foods. The training plan is similar to the way of eating – at a time needs to be changed. While in the case of a diet sufficient in some cases minor adjustments, whereas when it comes to training we introduce a thorough rearranging the furniture. If you trained for the last few months, “split”, you can consider the introduction of FBW, if practiced at low reps, you should think about the periodic increase in their number in each series. You can also change the order of exercises, modify the length of breaks between sets, slow movements, change the width of the grip … The number of possible combinations is unlimited. Unfortunately, many people take with their “favorite” exercises combined in “verified” sets, which only tangible result is just stagnant. Both assumptions diet and exercise should be carried out with an appropriate engagement. If being in the gym you have time for it to conduct free discussions with colleagues, call, read a newspaper or give closer vague reflections, this means that a knock or shake, and not – exercise. Training should take place on the intensity of the conversation between sets was uncomfortable for you. The situation is similar with the diet. To lose weight is not enough to simply “eat less”, yet most people with overweight and obesity, it seems that they eat very little. Similarly, in order to build muscle is not enough to “eat a lot of rice, meat and cottage cheese.” A good diet is more than just this kind of idea! Although, as with the rest of you just mentioned, a high level of commitment is necessary to list the rewarding effects of diet and exercise, this excessive perfectionism can be as big a problem as a total smack topic. Why? Practice shows that those seeking 110% often experience the phenomenon that is the fact that the effects are inadequate to the effort. This is probably related to the high intensity of stress, which leads to increased activity of the hypothalamic-pituitary-adrenal axis and increase cortisol. It is from time to time “chill”, give yourself a little freedom and not treat the issue of training and diet in terms of “life and death”. Involvement is needed, but at 90 – 100, not 110%! Although it would seem that overtraining applies only to competitive athletes, in practice it is different. This condition can also occur in people practicing amateur and recreational if they do not pay due attention to the periodization of training, including diversity of their intensity and in the case of neglecting the issue of appropriate regeneration. Overtraining can have a different course, different symptoms and different severity. Often appear: stagnation or regression, fatigue, aversion activity, decreased mood, decreased immunity, sleep problems, and many others. Always bear in mind that after a period of intensive training are required rest periods when exercise intensity is reduced. It should also take care of the proper amount of sleep and – appropriate qualitative and quantitative selection of foods. Dietary supplements for active people are usually advertised in such a way as if their use depended on what effects it will bring training and diet. Consequently, it is easy to believe that the key to success is the right choice of products supporting. Unfortunately, focusing all attention on supplementation usually leads to a reduction of interest issues of elementary, such as diet, exercise choice stimulus, rest and sleep. The facts are that nutrients and supplements are only a modest supplement to diet and exercise and their real impact on the listed effects is relatively small. Forgetting this fact, it is easy to fall into the marketing trap and spend many months or even years, still in the same size. Stagnation in the work of generally understood form is usually caused by a fairly trivial mistakes we make in the selection of a nutritionally-training strategy. It is important to be able to recognize the problem and make the appropriate remedies. To be able to do this, you need to get rid of misconceptions regarding the validity of the action taken. Theories such as: “Training is good, then to me there is something wrong,” lead only to frustration and lie at the root of the problems with the efficiency of effort in shaping the body.